What are the 4 numbers of a flight rating? 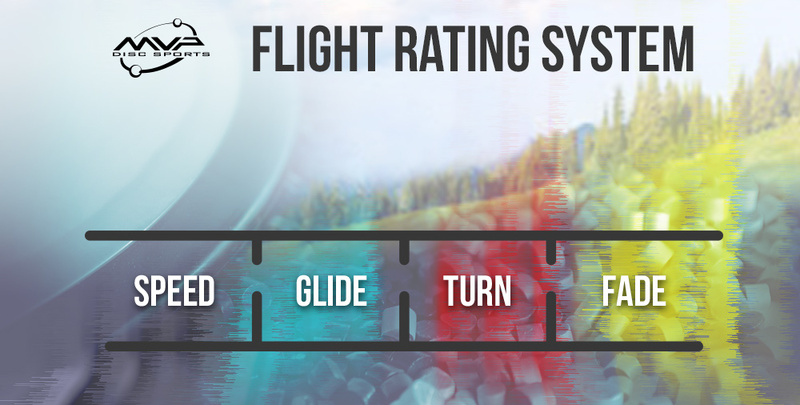 The 4 number flight rating system can be broken down into 4 categories: Speed, Glide, Turn, and Fade. Each of these characteristics help to express the overall flight of a disc and can serve as a guide to what you can expect out of a disc before throwing it. All of our ratings are based on the idea that the player is throwing right-hand backhand (RHBH). Our flight charts (found here), can also be incredibly helpful and include information for forehand, and left-handed players. There are a lot of instances where a whole number just does not accurately describe a flight characteristic, and we have a number of discs that just don’t fit a whole number rating. We strive for accuracy and consistency with our products, and because of this we have chosen to include the potential for a .5 variance, as we believe it gets us closer to the actual characteristics of a disc. Speed is an indicator of the amount of initial velocity necessary to achieve optimal flight of the disc. A speed 10 disc, by its design, is intended to fly further than a speed 5 disc. However, the skill necessary to achieve the optimal flight of a speed 13 disc is greater than that of a speed 5 disc. Speed is not a measurement of how far an individual player will throw. Lower speed discs require less power to achieve their optimal flight, and in a lot of cases, a lower speed disc will fly farther and more accurately than a high-speed disc when thrown by an intermediate player. Glide is the measure of how well a disc retains loft in relation to the amount of power of the throw. Low-speed discs with a higher glide rating are easier for new players to achieve longer flights. A disc with a lower glide rating will be more resistant to wind, and players will be able to achieve more consistent lines in windy conditions. Turn is an early characteristic of disc flight, represented with our numbers 0 to -5, that occurs as a result of the aerodynamic forces exceeding the gyroscopic forces of the disc. As a result of Bernoulli’s Principle exerting more lift on the upper left surface of the disc (for a right-hand backhand throw), the disc will drift towards the right during this phase of flight. GYRO® discs will always have a more predictable and controllable turn phase of flight because of the enhanced gyroscopic effect. A turn of 0 will fight wind and resist turning over the most. While a disc with a turn of -5 will turn over the most and are useful for large sky anhyzer shots or quick turnover rollers. Fade is a characteristic of flight that occurs during the later phases of disc flight, represented with our numbers 0 to 5. Fade occurs when a disc begins to drop and forces of air on the bottom wing of the disc begin to exceed the lift forces keeping the disc in flight. As a result of Bernoulli’s Principle exerting more lift on the bottom left wing of the disc (for a right-hand backhand thrower), the disc will fade towards the left during this later phase of flight. GYRO® discs will always have a more controlled forward penetrating fade because of the enhanced gyroscopic effect. A disc with a fade of 0 will finish the straightest and see the least amount of left movement towards the end of their flight. While a disc with a fade of 5 will see a hard hook to the left at the end.